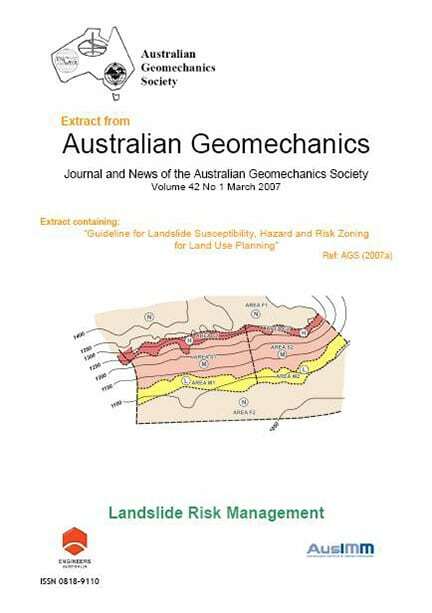 In recognition of the challenge between development pressures and landslide hazard, in the year 2000 the Australian Geomechanics Society (AGS) published a benchmark technical paper “Landslide Risk Management Concepts and Guidelines” (AGS, 2000) – which significantly updated an earlier 1985 guideline. 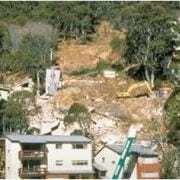 It was recommended in the report of the Coroner’s Inquiry into the 1997 Thredbo landslide that AGS (2000) be taken into account – through directions in the Building Code of Australia and local codes dealing with planning, development and building approval procedures – when assessing and planning urban communities in hillside environments. Whilst AGS (2000) presented concepts and guidelines to assist practitioners, there remained a need to provide supplemental information to further assist practitioners, to assist regulators and to provide advice to the broader Australian population. 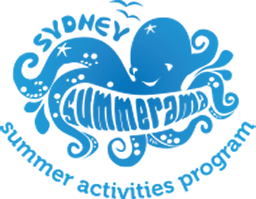 This was recognised by the SCCG who in turn submitted a successful grant application under the NSW and Commonwealth Governments’ National Disaster Mitigation Program. The project(s) are intimately related to management of risk associated with landslides in all parts of Australia, covering sloping terrain generally and with applicability to the coastal and near-coastal environment. 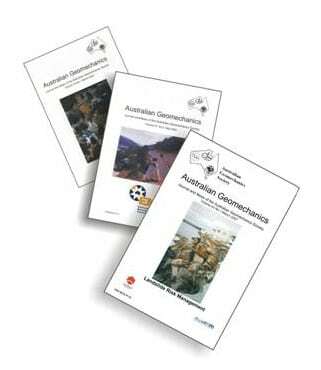 The project involved the development of two guidelines, two commentaries and a suite of GeoGuides. These provide assistance variably to regulators, practitioners and owners and occupiers of property and land potentially subject to landslide hazards. The Landslide Zoning Guideline covers landslide susceptibility, hazard and risk zoning for land use planning. It provides guidance to government regulators (officers of local government and state government instrumentalities) and geotechnical practitioners in the methods of Landslide Hazard Zoning. Such characterisation provides input to the land use planning process in areas of landslide hazard. This guideline is supported an associated commentary document. 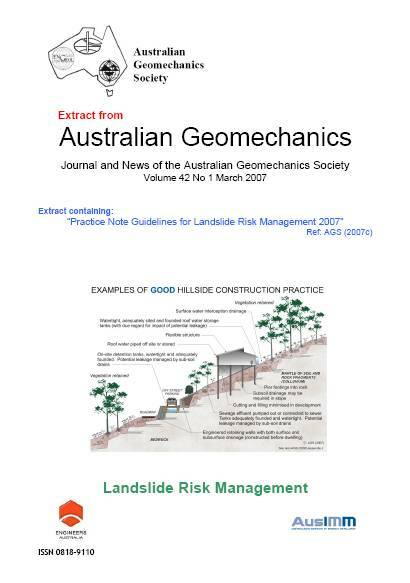 The Slope Management Guideline – known as the Australian GeoGuides for Slope Management and Maintenance – provides owners and occupiers, and therefore the public in the broader sense, with guidance on management and maintenance of properties subject to landslide hazard. 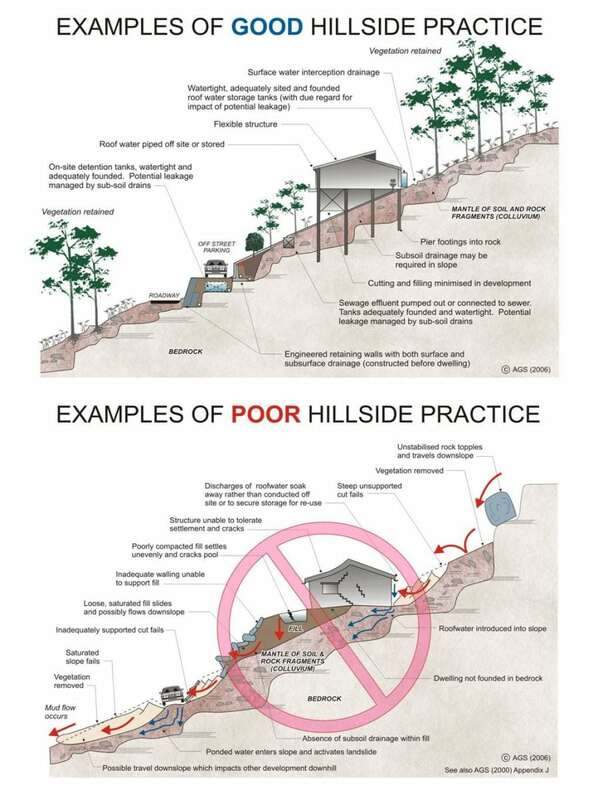 These two guidelines are important contributions to the management of landslide hazard at both ends of the process – initial identification of landslide hazard in the planning process, and management of properties prone to landslide hazard by the end-user. 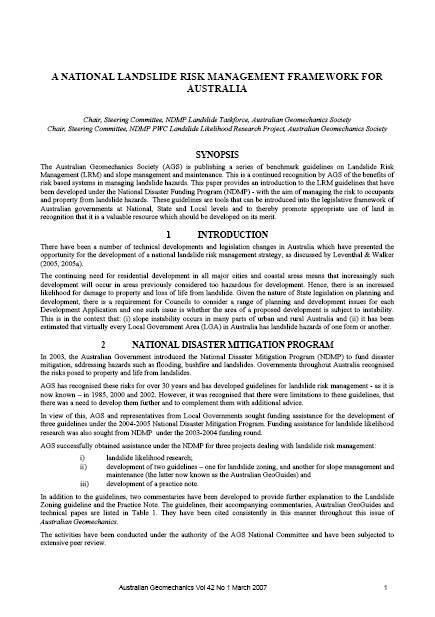 The guidelines benefit the general community (Australian GeoGuides) and Local Government regulators (Landslide Zoning) through achieving safer, more sustainable communities in relation to their exposure to landslide risk, and reduce risk to the community through improved planning and slope management practices. These guidelines link with the risk management practices presented in AGS (2000) and the recently published Building Code of Australia (BCA) Guideline, and will provide long-term natural disaster mitigation benefits to housing and infrastructure. The LRM Practice Note provides guidance to practitioners in the performance of project specific landslide risk assessment and management, and also to government officers in interpretation of the reports they receive. The Practice Note is suited to be an external reference document for legislative requirements. The Practice Note supersedes the recognised industry “standard” on LRM in Australia – AGS (2000). The guidance provided by the Practice Note is of a technical nature and is mainly for the geotechnical practitioner for the production of landslide risk assessment and management for development in areas prone to landslide hazard. This includes guidance on appropriate methods and techniques, and tolerable levels of risk. Currently, an acceptable level of risk to life for the individual most-at-risk is reasonably well identified, though perhaps conservatively so. As a result of a number of issues, there has been no similar guidance for risk to property, which is now provided in the Practice Note. 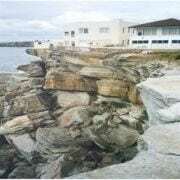 In early 2008 the SCCG and Australian Geomechanics Society Landslide Risk Management Project was awarded the prestigious Warren Medal the premier award of the Civil College. “AGS (2007)” was submitted for judging in the Australian Safer Communities Awards 2008 in the category of “Projects of National Significance”. The project received a ‘High Commendation’. Award winners are recognised “throughout the emergency management sector for their outstanding achievement, innovation and professional standing”. 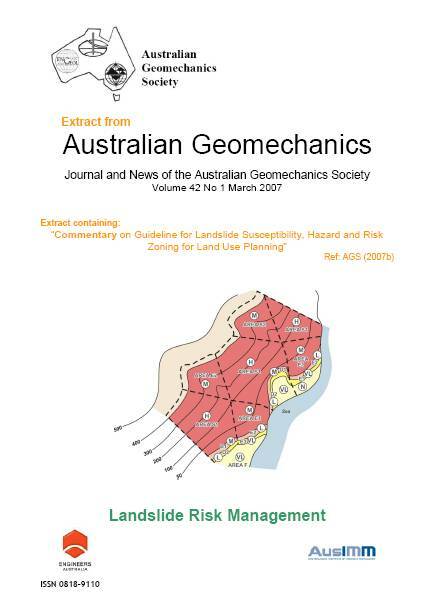 Journal of Emergency Management in Australia, Landslide Risk Management for Australia.